Peppermint (Mentha piperita) is a plant used for medicinal purposes. 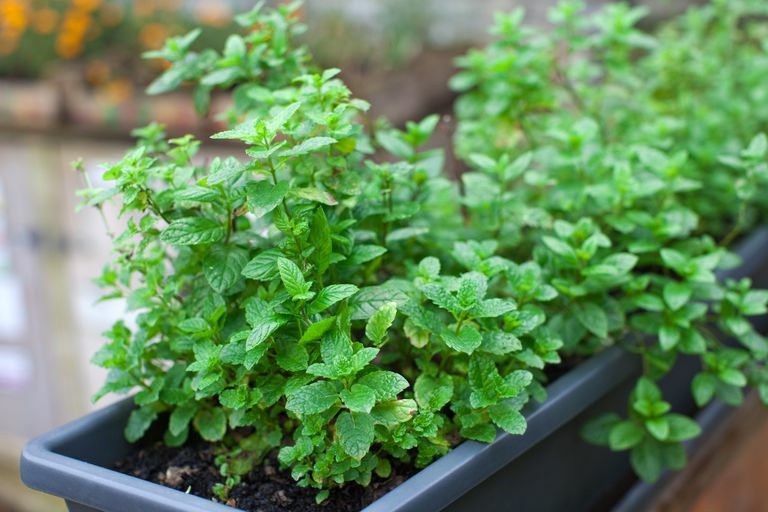 The plant's oil is often taken in dietary supplement form, while peppermint leaf is frequently used to make herbal tea. One of the most common uses of peppermint is to ease digestion. Peppermint oil, obtained by extracting the oils from dried or fresh leaves and flower tops with alcohol, is commonly used in naturopathic therapies and aromatherapy. When taken in supplement form, peppermint oil often comes in enteric-coated capsules. Enteric coating is used to prevent peppermint oil from being released in the stomach and causing side effects like heartburn. Peppermint is a hybrid aromatic, created by crossing spearmint with watermint. Peppermint has a cooling effect that people find refreshing and exerts mild antimicrobial and anesthetic properties. Peppermint oil also acts as a mild carminative agent (a substance used to eliminate intestinal gas). As a dietary supplement, peppermint products do not need to undergo the rigorous testing that pharmaceutical drugs do. Because of this, some of the conditions peppermint is believed to treat are unsupported by research. With that being said, clinical research is increasing, offering glimpses into the potential benefits of peppermint and peppermint supplements. Peppermint appears to have a relaxing effect on the bowel, whether to control the symptoms of irritable bowel syndrome (IBS) or to ease discomfort during an exploratory procedure. According to a review of studies published in the Journal of Clinical Gastroenterology, peppermint oil appears a safe and effective short-term treatment for IBS, Analyzing nine high-quality studies involving 726 participants, the researchers concluded that peppermint was far better at relieving IBS symptoms than a placebo. It is believed to do so by reducing muscle spasms in the intestines. The same effect has been seen when peppermint oil is added to an enema prior to a colonoscopy or barium X-ray. Peppermint oil appears to ease involuntary muscle contractions during a colonoscopy and, by doing so, reduces the incidence and severity of cramps, according to research published in Acta Gastro-Enterologica Belgica. A study published in Alimentary Pharmacology and Therapeutics suggested that a combination of peppermint oil and caraway oil may help soothe symptoms of indigestion (dyspepsia). The study involved 96 people with functional dyspepsia (the type characterized abnormal stomach movements). After a 28-day course of treatment, involving 90 milligrams of peppermint oil and 50 milligrams of caraway oil, the participants experienced greater relief of stomach pain, pressure, heaviness, and fullness than those given the placebo. The same benefits may extend to the treatment of morning sickness (hyperemesis gravidarum), although research is lacking into the effectiveness of the approach. Sipping peppermint tea is also commonly used to help relieve nausea and upset stomach. The topical use of peppermint oil may help relieve migraine headaches, suggests a 2010 study published in the International Journal of Clinical Practice. For this study, 35 people with migraines were treated with either a peppermint-oil-based solution or a placebo during a migraine attack. In each case, the oil was applied topically to the forehead and temples. Compared to the placebo, the peppermint-oil-based solution was more effective in relieving pain, nausea, vomiting, and the extreme sensitivity to light and/or sound. In another study involving 41 people with tension headaches, peppermint oil applied to the forehead was found to be as effective as 1,000 milligrams of Tylenol (acetaminophen). The mechanism for this effect is not entirely clear. It is believed that the oil may numb the trigeminal nerve that branches from the cheek and jaw to the forehead. This is the same nerve string implicated in migraines and tension headaches. On top of that, the scent of peppermint may induce a calming effect that helps relax people in throes of a severe headache. It is why peppermint is commonly used in aromatherapy as a means of stress relief. There is no doubt that peppermint can freshen your breath. On top of the pleasing aroma, peppermint's antimicrobial properties may help kill many of the mouth bacteria implicated in bad breath (halitosis). This is evidenced in part by research conducted in 2013 in which peppermint oil was able to kill oral pathogens like Staphylococcus aureus, Escherichia coli, and Candida albicans at non-toxic levels, making it an ideal candidate for an oral antiseptic. The cooling, numbing effect of peppermint oil may also provide relief after a minor dental procedure, alleviating pain while providing antibacterial protection. On the other hand, peppermint has neither been shown to reduce dental plaque nor ease gum inflammation caused by gingivitis or periodontitis. As with eucalyptus, inhaling peppermint has a clearing effect in the sinuses and nasal passages. Peppermint oil applied beneath the nostrils or inhaled with steam is an effective means of opening these passages, whether caused by an allergy, cold, or sinus infection. While some argue that inhaling any steam can unclog congestion, a 2014 study in the Avicenna Journal of Phytomedicine reported that peppermint itself directly affected respiratory function. According to the research, the oral administration of peppermint capsules to athletes increased key respiratory measures within five minutes. This included increasing the forced vital capacity (FVC) by 35.1 percent and the peak expiratory flow (PEF) by 65.1 percent. The control group not provided peppermint experienced neither of these things. While potentially beneficial in relieving sinus congestion, there is no evidence that peppermint can treat the underlying cause, whether infectious or allergic. In the same way that peppermint can help ease muscle spasms in the colon, research suggests that it may do the same for women with menstrual cramps. A study conducted in 2016 explored the use of peppermint in 127 women with painful periods. According to the researchers, peppermint oil capsules taken for three days from the start of menstruation were just as effective in reducing the intensity and duration of pain compared to non-steroidal anti-inflammatory drugs like Motrin (ibuprofen) or Aleve (naproxen). Peppermint is generally safe to use but may trigger side effects in some, including heartburn and allergic reactions such as headaches, flushing, and mouth sores. Additionally, enteric peppermint oil capsules should be used with caution in people with gallstones, heartburn, hiatal hernia, severe liver injury, or bile duct obstruction. Taking a peppermint capsule may only worsen the symptoms of these conditions. If used topically for aromatherapy, it is important to dilute the peppermint oil with a carrier oil like almond or jojoba oil. This is especially true if you have sensitive skin as the undiluted oil may cause a mild burning sensation or redness. Even diluted, peppermint oil should never be applied to the skin of children. Peppermint, especially peppermint oil, can alter how certain medications are metabolized in the liver, increasing both the drug concentration and the risk of side effects. These interactions generally range from mild to moderate. To avoid interactions, always speak with your doctor before using peppermint oil, peppermint capsules, or any peppermint preparation intended for medical or health purposes. Most peppermint supplements are available in enteric-coated capsules or gel caps. Doses typically range from 90 milligrams (mg) to 120 mg. There no standardized dosing recommendations, but many manufacturers will endorse doses of between 180 mg and 240 mg three times daily to treat indigestion. While there are no exact recommendations for other health conditions, dosages within this range are generally considered safe and tolerable. By contrast, peppermint essential oil is not intended for internal use, whether to treat dental pain, sinus congestion, or indigestion. Enteric-coated peppermint oil capsules and peppermint essential oil can be found in drugstores, natural foods stores, and alternative health stores. You can also purchase them online. Fresh peppermint and peppermint tea can easily be found at most grocery stores. If purchasing a peppermint supplement, always look for brands certified by the U.S. Pharmacopeia (USP), NSF International, or ConsumerLab for quality and safety assurance. Since some gel caps are made with animal-based gelatins, look for those made with vegetable cellulose (hydroxypropylmethylcellulose) if you are vegan or vegetarian. Never drink peppermint oil. Peppermint oil is far more intense and concentrated than other essential oils and can lead to poisoning. Symptoms include a slowed heart rate, rapid breathing, dizziness, nausea vomiting, blood in urine, the inability to urinate, convulsions, and unconsciousness. If you or someone you know accidentally drinks peppermint oil, call 911 or the National Poison Helpline at (800) 222-1222. Do not induce vomiting unless you are told to do so. Borhani Haghighi, Motazedian S, Rezaii R, et al. Cutaneous application of menthol 10% solution as an abortive treatment of migraine without aura: a randomised, double-blind, placebo-controlled, crossed-over study. Int J Clin Pract. 2010 Mar;64(4):451-6. DOI: 10.1111/j.1742-1241.2009.02215.x. Khanna R, MacDonald JK, Levesque BG. Peppermint oil for the treatment of irritable bowel syndrome: a systematic review and meta-analysis. J Clin Gastroenterol. 2014 Jul;48(6):505-12. DOI: 10.1097/MCG.0b013e3182a88357. Göbel, H.; Fresenius, J.; Heinze, A. et al. Effectiveness of Oleum menthae piperitae and paracetamol in the therapy of headache of the tension type. Nervenarzt. 1996 Aug;67(8):672-81. Masoumi, S.; Asl, H.; Poorolajal, J. et al. Evaluation of mint efficacy regarding dysmenorrhea in comparison with mefenamic acid: A double-blinded randomized crossover study. Iran J Nurs Midwifery Res. 2016 Jul-Aug;21(4):363-7. DOI: 10.4103/1735-9066.185574. ﻿May B, Köhler S, Schneider B. Efficacy and tolerability of a fixed combination of peppermint oil and caraway oil in patients suffering from functional dyspepsia. Aliment Pharmacol Ther. 2000 Dec;14(12):1671-7. Meamarbashi, A. Instant effects of peppermint essential oil on the physiological parameters and exercise performance. Avicenna J Phytomed. 2014 Jan-Feb; 4(1): 72-8. Shavakhi A, Ardestani SK, Taki M, Goli M, Keshteli AH. Premedication with peppermint oil capsules in colonoscopy: a double-blind placebo-controlled randomized trial study. Acta Gastroenterol Belg. 2012 Sep;75(3):349-53. Thosar, N.; Basak, S.; Bahadure, R. et al. Antimicrobial efficacy of five essential oils against oral pathogens: An in vitro study. Eur J Dent. 2013 Sep;7(Suppl 1):S71-7. DOI: 10.4103/1305-7456.119078. Can Cayenne Help Relieve Low Back Pain?